BeoPlay P6 review: Portable perfection? If you're looking for a well-made and great-sounding portable Bluetooth speaker then the BeoPlay P6 is a sensational option... but the BeoPlay A1 makes more sense to us and is a little cheaper too. BeoPlay, the offshoot from Danish high-end audio maker Bang & Olufsen, makes some of our favourite looking and favourite sounding portable speakers. The BeoPlay P6 embodies the design language we've grown to love, in a less common form factor. Is it the perfect portable? When it comes to portable speakers, the BeoPlay A1 has been our go-to Bluetooth speaker for travel. Its circular shape and small size make it ideal to pop in a bag when heading away from home for a couple of days. The BeoPlay P6 is an entirely different shape, an upright wedge that's larger than the A1, thus a little less practical to carry around. We took it in hand luggage on a plane, however, so it's hardly massive. Out of the two, however, we find the A1 more convenient than the P6. The P6 is all about wireless connectivity too. Look around its body and all you'll find is a USB-C port for recharging. There's no 3.5mm input, which is a shame. For controls, the P6 offers five buttons up top, which are clearly marked. Adjust volume, sync Bluetooth, switch the device on/off (with associated beep), or hit the 'One Touch' button for smart features - such as using a voice assistant to control your music service. In terms of build quality, this is where Bang & Olufsen really shines. 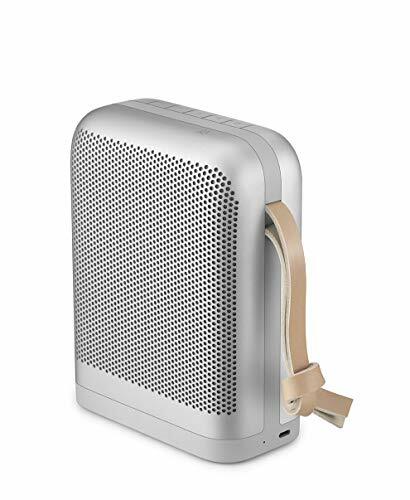 The BeoPlay range uses a blasted aluminium, shown here in its natural finish, with individual milled holes as the grille. The panels are joined by a slightly off-colour polymer base and sidings, however, which make the black model look that bit more seamless. Still, pick either and you won't be disappointed. There's the hallmark leather strap, too, for hanging the speaker up. As the P6 has grilles to both sides, it can output sound omni-directionally, with strong output in two directions that make it sound loud and clear wherever the speaker is placed. The sound quality is pretty sensational for a small speaker, too, although it's not a huge upgrade over the A1, so the extra cost for the P6 is somewhat questionable. Both products sound great, but the A1 seems like the better all-rounder with wider appeal to us. Small speakers aren't often great when it comes to handling bass, but the P6's low-end sinks downto 55Hz, which outputs a good dollop of bass and thumping kick drums, whatever the genre of music. On our travels the P6 has kept us entertained for many hours, living up to its 16 hours per charge no problems. Shame the USB-C port isn't fast-charging, as it takes three hours to rejuice this smartphone-capacity battery - although it's very easy to leave it plugged in while listening. The BeoPlay P6 by Bang & Olufsen certainly delivers sensational sound. However, its asking price is somewhat sensational too, meaning its smaller, rounder BeoPlay A1 cousin is a more logical purchase in our book. The smaller, rounder alternative that costs a little less is still our favourite portable Bluetooth speaker. It's rather pricey, but cheaper than the P6 and sounds sensational for something of this scale.